[Update 8/30/09 a year later, I made this dish again and loved it as much, if not more. I am updating the recipe to be less of a record of the original creation and more of a general recipe). I seem to be on this vegetarian comfort food kick. 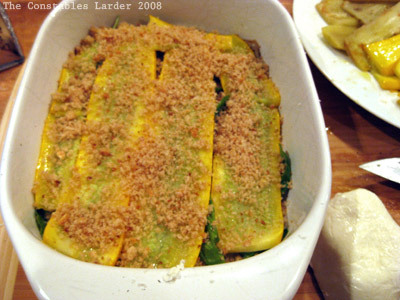 Tonight’s dinner was a lovely success, layering eggplant, zucchini, cheese, breadcrumbs and basil. I completely winged it (having only about 2 brain cells left to rub together after a late night and a long day) but at the first bite Lisl and I were both at “wow!” I suppose I shouldn’t be surprised… melted veggies with gobs of cheese and olive oil? As Mr. Powers would say, yeah baby! In a food processor, pulse your bread into coarse breadcrumbs. Preheat oven at 350F. 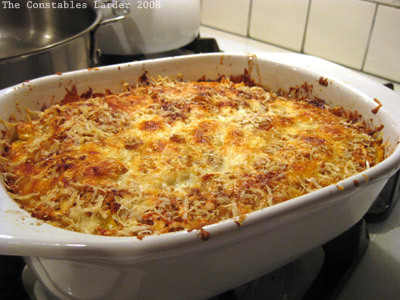 In a baking tray, spread out the crumbs and bake, occasionally stirring around, until lightly browned. 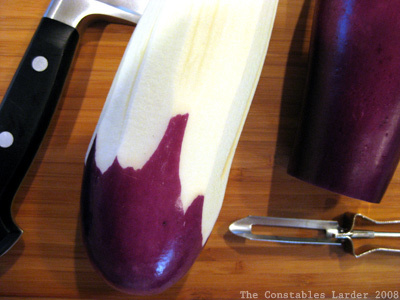 Peel the eggplant with a vegetable peeler and slice lengthwise into slices about 2 millimeters thick. (Optional: salt both sides of the eggplant and place in a colander to drain for about 20 minutes. Dry the slices with paper towel. Then slice the zucchini the same thickness. Heat a large pan with olive oil on medium to medium-high heat and saute your eggplant and zucchini for 30-40 seconds a side, adding more olive oil to the pan between each batch. You don’t need to cook the slices all the way, just enough to soften them. 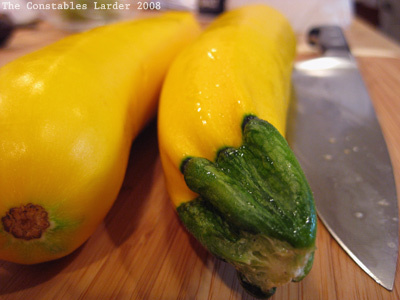 Don’t be afraid to cut your slices of eggplant or zucchini into the necessary size to fit the gaps in a layer. Where it calls for salt and pepper, just add 2 or 3 turnings of a grinder. The order of the layers and ingredients is anything but scientific — the flavors will blend together nicely. Optional: drizzle some olive oil over top. Baked for 50 minutes at 350F. You get a delightful crust and a totally melted core. The layer of basil really permeates this dish nicely. It’s rich, but oh so satisfying. This dish can handle a hefty, peppery red wine should you be so inclined. I’ll end with a few “ingredients” pictures. I love how this one came out. 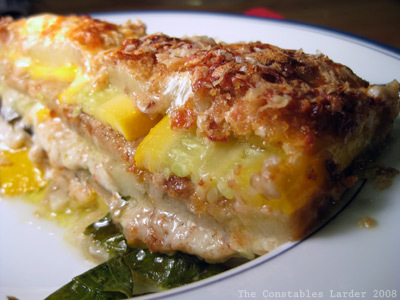 I was going to make an olive oil zucchini cake w/ the bounty, but will make this instead! I’d never heard of a “tian” before, so thanks for teaching me something new Stacey! I hope you like the results. I just had the leftovers for lunch, and the basil permeated the dish even more overnight and in re-warming. Delicious! I love non-recipes like this. Can’t wait to try it. Our growing season here in FL is opposite and doesn’t start until October or November, so I’ll have to wait until then! I get the point much better when pictures are out of focus. This way I don’t have to look for my glasses. That’s a little too much cheese for me to make that dish, but I’m pretty sure if you served this to me I’d love it. I’m starting to adapt to grilled cheeses in gratins. They’re talking about not ripping my French nationality off me yet.